Virtua Fighter is one of the most critically acclaimed games of all time, introducing 3D Polygon graphics to the gaming industry. Alike many of the other popular fighting games of the 90s, the player could choose between 8 playable characters who had their own individual yet distinctive moves and fighting style. Following the popular 3 round dynamic of gameplay, the player would have had to face 9 characters in total. The initial 8 were all of the playable characters (including a duplicate of the chosen character and a boss). 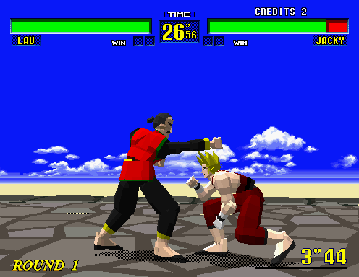 The player would control their chosen character with 3 buttons (punch, kick and guard) whilst using the joystick to determine if the hit was high or low. The Virtua Fighter series undoubtedly left its mark on the future of gaming. Introducing 3D polygon graphics, the game is noted for being the reason that the PlayStation consoles support 3D graphics. Other notable elements of the game include the dynamic camera that could pan and zoom for effect within the game play. Sega’s critically acclaimed Daytona USA took the arcade world by storm in 1993. The racing game reinvented the genre, up-scaling the graphics of its predecessor (Virtua Racing) to the modern and relatively realistic for the day 3D polygon style. As the 93 release was only limited, a revised edition saw a worldwide launch in 1994. Similar to the game play of the genre, the player controlled a car (known as Hornet) would choose between 3 tracks and could choose whether they played in manual or automatic. The aim was to complete the race before the timer ran out and out-run the competing cars. Two playable modes were available in Daytona USA, as the hit game revolutionised arcade multiplayer. Through linking up 4 twin cabinets or 8 deluxe cabs (single player) – Sega allowed for up to 8 players to go head to head. Additionally, the twin cabinets included a front facing camera that would record the player’s face on a separate screen. The Daytona USA series is still going today and has undoubtedly modernised the genre. Upon initial release, the popularity was evident as it won the American Amusement Arcade Machine Association’s Diamond Award. Midway’s NBA Jam is famed for popularising the basketball video games genre and became the first of a spanning series. Initially, NBA had rejected the game, believing that the branding was wrong, though were convinced upon a second pitch. Due to the licensing, Midway paid NBA $100 dollars of every unit sold. The hit game is well-known for the likeness of the players they represent, which was created through digitising footage of amateur players. Interestingly, Michael Jordan does not appear in the game as he owns the rights to his name and likeness instead of NBA. Though a special edition was created that included him as a playable character, it was given to himself for personal use. Game play consisted of 2 on 2 basketball with exaggerated nature of play as characters could jump many times their own height. No fouls or violations from basketball were kept in the videogame which allowed players to barge past others and knock them out of the way. Power-ups were included in the game, as if the player scored 3 times in a row – they would be ‘On Fire’. This gave them unlimited turbo and increased shooting precision, only ending when either the other team scored or the player did 4 more times in a row. Easter eggs were rife in the game, with special players (including then President Bill Clinton) being activated through using their initials or certain button combinations. A hidden tank game was also hidden within the arcade game play. In the arcade release the teams that featured were the rosters from the 1992 – 1993 NBA season (93-94 on ported versions). As well as Michael Jordan, other famed basketball players did not make it the final game – mostly for legal reasons. 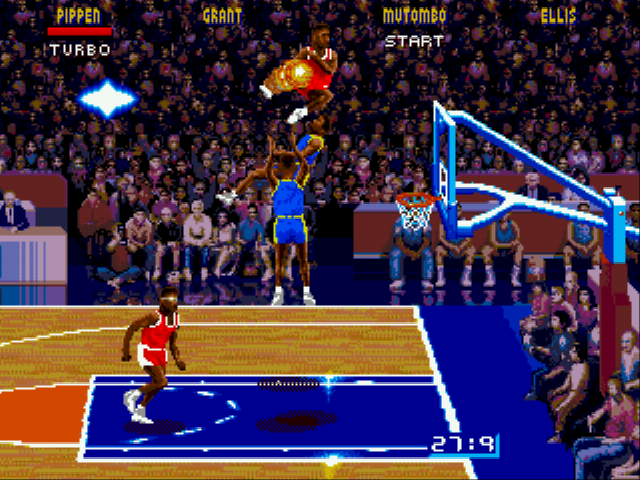 For example, Shaquille O’Neil featured in the arcade version but no other console ports. Rumours that the game was biased against the Chicago Bulls were confirmed by the creator, claiming that the players were programmed to miss last second shots amongst other abilities.